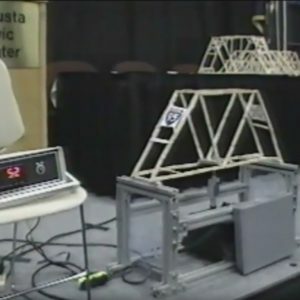 This video shows the top three performing bridges from the 2011 Maine Transportation Conference Popsicle Stick Bridge Competition. Evidently this is a competition that has been going on for a long time, and these bridges are impressive. I gather that the contest is open to anyone, as long as you purchase your popsicle bridge kit from the Maine ASCE Student Chapter which costs $10. This video is a fun documentary of the best bridges, and you can tell the competitors are having a lot of fun. It’s too bad I didn’t get to Maine in time for this competition, I would have loved to attend. I like this video because of the commentary. The observers discus their opinions about why each bridge failed (casually) as the video plays. Notice the comment about lateral bracing on the first bridge. Would you agree with them? Did you catch how the second bridge failed? This would have been an easy fix, and it just goes to say how you should reinforce the loading area on your popsicle bridges. Take the lessons from this video and use on your own models. I also appreciate this video because the winner shares my name, Garrett. What do you think made Garrett’s bridge so strong? They all held tremendous amounts of weight which was amazing but that last one was outrageous because it held 1100-1200 which I can’t and won’t believe it. How many popsicle stick were used in the last one? do you have the project? send me pleaseeee, not for a competiitonm but to a University jobs. how many popsicle sticks were used in the second one? we are doing a similar project in a shop class. 51 queries in 0.494 seconds.